Mini Bike Pump with BONUS Glueless Puncture Repair Kit! Fits Presta & Schrader (No Valve Changing Needed), 120 PSI Mini Portable Cycle Frame Pump for All On & Off Road Tires. ‘Super Fit Clever Valve’ Automatically fits Presta and Schrader valves, No Valve Change Needed! Most other miniature pumps do not connect well to Presta – read the reviews! Vibrelli ‘Super Fit Clever Valve’ automatically locks on tight to any valve, guaranteed! Made to Last: Aircraft Grade Aluminum! 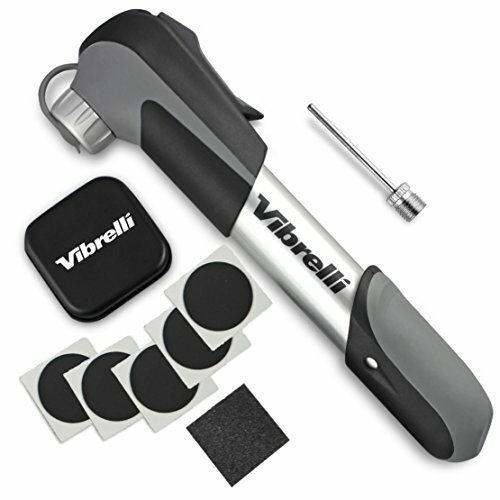 Vibrell’s compact bike tire pump is made from 6061 Aluminum Alloy, the stuff airplanes are made from! Rest assured this frame mounted bike mini pump will outperform other bicycle pumps up to 120 PSI. Cheaper plastic air pumps fool the consumer, struggling to even pump past 60 PSI. You need a mini bike pump when you least expect it, and you need to be prepared for punctures also. Get riding again fast with Vibrelli’s GLUE-LESS puncture repair kit. Just patch and inflate fast! Vibrelli’s frame pump is an engineered high performance, lightweight and robust portable bike pump. The dual Telescope feature allows for high pressure pumping to 120 PSI, the perfect small road cycle pump. For volume inflation simply release the extendible telescope allowing more air per stroke, the perfect mountani bike pump – inflate faster! Why the Vibrelli Premium Portable Mini Bike Pump? ✓ Presta & Schrader compatible, no annoying valve change needed! ✓ ‘Super Fit’ seal for all valve types – no leaks! ✓ BONUS Glueless puncture repair kit – pocket sized! ✓ Bike attachment bracket included✓ NO VALVE CHANGING NEEDED – Mini bike pump is automatically compatible with both Presta and Schrader! ✓ SUPER FIT CLEVER VALVE” NO LEAKS – Firmly grips both Schrader and Presta valves automatically. This bike tire pump will not leak like other bike hand pumps often do! ✓ BIKE FRAME MOUNT- attaches securely to your bike. Velcro holds your portable tire pump firmly in place. ✓ BONUS GLUELESS PUNCTURE REPAIR KIT – Included with your portable bike pump, be prepared for a flat tire anywhere!